English musician, singer, songwriter and actor Ringo Starr (1940) gained worldwide fame as the drummer for the Beatles. He occasionally sang lead vocals, such as for the hit Yellow Submarine. 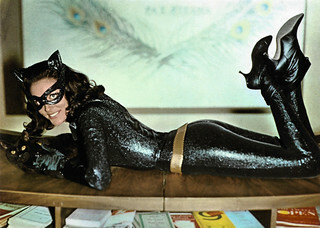 Starr played key roles in the Beatles' films and appeared in numerous others. After the break-up of The Beatles, Starr released several successful singles, including It Don’t Come Easy and Back Off Boogaloo. Italian collectors card in the Dzuboks Pop Parada by Panini, Modena, no. 2, 1975. American postcard by Coral-Lee, Rancho Cordova, Ca. in the CL/Personality series, no. 65. Photo: Fred Ward, 1981 / Black Star. Ringo Starr was born Richard Starkey in a small two-storey house in the working class area of Liverpool, England, in 1940. He was the only child of Elsie (née Gleave) and Richard Starkey, who both worked in a bakery. During childhood ‘Ritchie’ was twice afflicted by life-threatening illnesses. In 1953, he contracted tuberculosis and was admitted to a sanatorium, where he remained for two years. During his stay the medical staff encouraged their patients to join the hospital band. 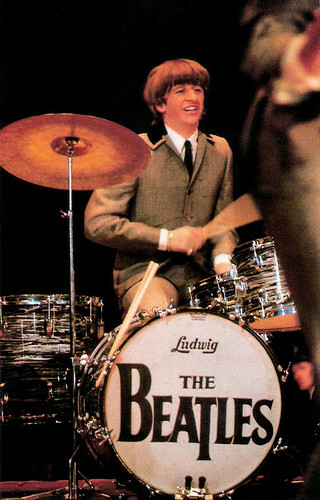 Ringo played percussion and grew increasingly interested in drumming. In 1955, he entered the workforce and did some odd jobs. He became a fervent admirer of the UK skiffle craze. In 1957, he cofounded his first band, the Eddie Clayton Skiffle Group. It earned several prestigious local bookings before the skiffle craze faded in early 1958 as American rock and roll became popular in the UK. When The Beatles formed in 1960, Starr was a member of another Liverpool group, Rory Storm and the Hurricanes. About this time he adopted the stage name Ringo Starr. After achieving moderate success in the UK and Hamburg, he quit the Hurricanes. Starr had performed with The Beatles during a few stand-in engagements while in Hamburg. 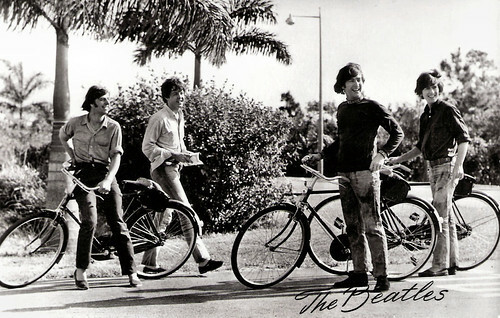 In 1962, he joined The Beatles, replacing Pete Best. 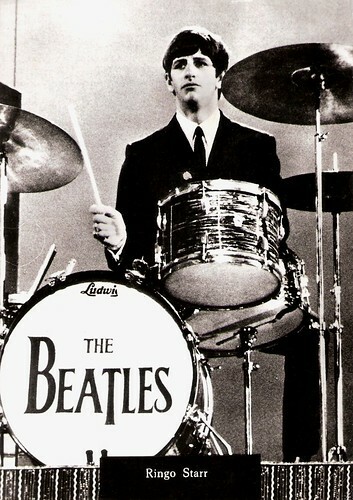 Ringo contributed to their first hit, Love Me Do, which reached the top of the US singles chart in 1962. Soon, he began receiving an amount of fan mail equal to that of the others, which helped to secure his position within the band. 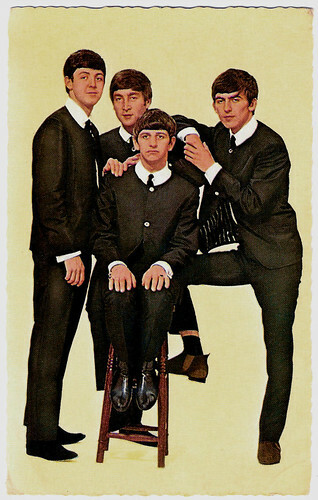 During 1963, The Beatles enjoyed increasing popularity in Britain. By the end of the year, the phenomenon known as Beatlemania had spread throughout the country, and by February 1964 The Beatles had become an international success, performing on The Ed Sullivan Show to a record 73 million viewers. After the release of The Beatles' second feature film, Help! (Richard Lester, 1965), Starr won a Melody Maker poll against his fellow Beatles for his performance as the central character in the film. In 1965, Starr married Maureen Cox, whom he had first met in 1962. By this time the stress and pressure that went along with Beatlemania had reached a peak for him. In August 1966, The Beatles released Revolver, their seventh UK LP. 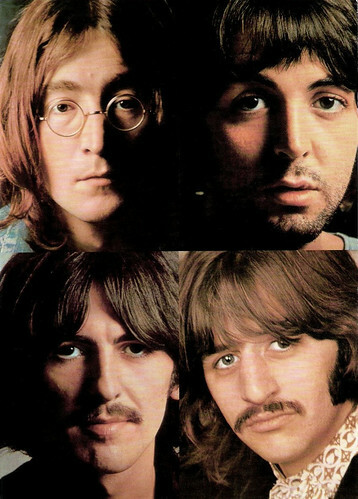 The album included the song Yellow Submarine, which was the only British number one single with Starr as the lead singer. Later that month and owing to the increasing pressures of touring, the Beatles gave their final concert. For The Beatles' seminal album, Sgt. 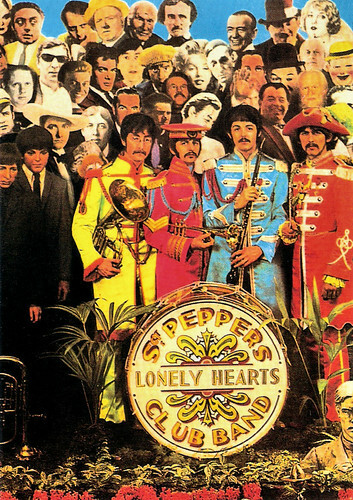 Pepper's Lonely Hearts Club Band (1967), Starr sang lead vocals on the Lennon–McCartney composition With a Little Help from My Friends. Brian Epstein's death in August 1967 left The Beatles without management. 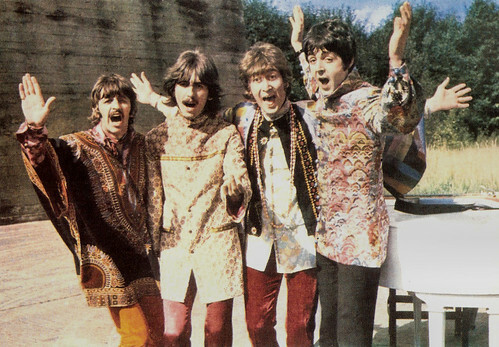 The band began an ill-fated film project, Magical Mystery Tour (The Beatles, 1967). 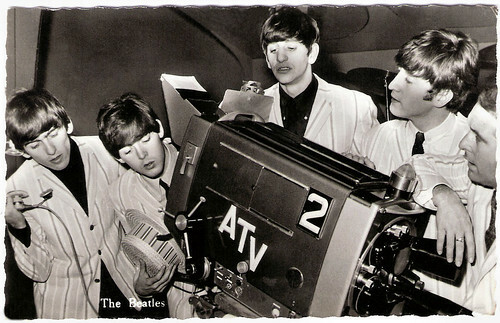 Starr's growing interest in photography led to his billing as the film's Director of Photography, and his participation in the film's editing was matched only by McCartney. During the recording of the White Album in 1968, The Beatles’s collective group dynamic began to decay. Despite a temporary return to congenial relations during the completion of the White Album, production of The Beatles' fourth feature film, Let It Be (Michael Lindsay-Hogg, 1970), and its accompanying LP, strained the already tenuous cohesion within the band. Dutch postcard by Rembrandt N.V., Amsterdam. Sent by mail in 1964. Italian postcard by Gruppo Editoriale Lo Vecchio, Genova. Picture: cover for the album Sgt. Pepper's Lonely Hearts Club Band (1967). 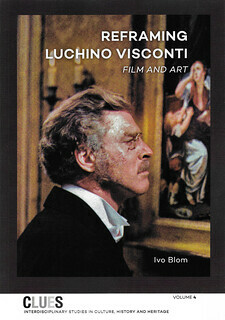 Italian postcard by Gruppo Editoriale Lo Vecchio, Genova. Photo: John Kelly. Publicity still for Magical Mystery Tour (The Beatles, Bernard Knowles, 1967). 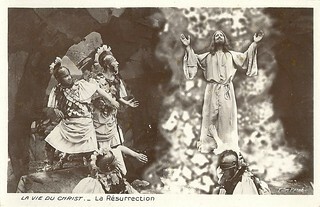 Italian postcard by Gruppo Editoriale Lo Vecchio, Genova. 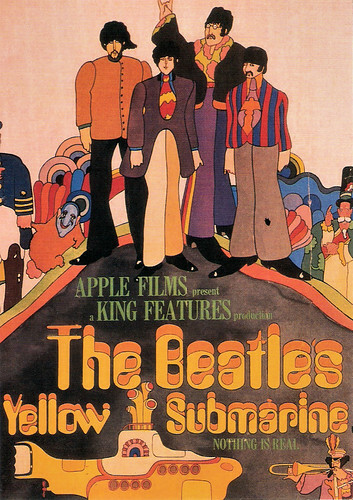 Picture: poster for The Yellow Submarine (George Dunning, 1968). George Martin was the musical director. 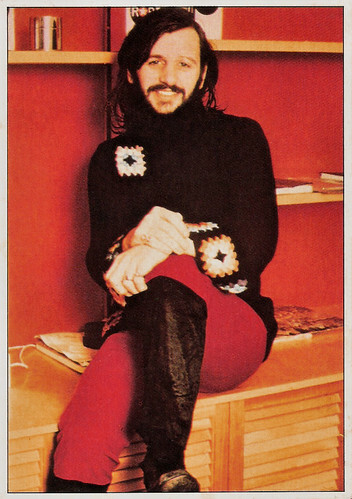 After the break-up of The Beatles in 1970, Ringo Starr played drums on John Lennon's album John Lennon/Plastic Ono Band (1970), Yoko Ono's Yoko Ono/Plastic Ono Band (1970), and on George Harrison's albums All Things Must Pass (1970), Living in the Material World (1973) and Dark Horse (1974). In 1971, Starr participated in the Concert for Bangladesh, organised by Harrison. They co-wrote the hit single It Don't Come Easy, which reached number four in both the US and the UK. Starr also acted in several films, including Candy (Christian Marquand, 1968), The Magic Christian (Joseph McGrath, 1969) with Peter Sellers, the Spaghetti Western Blindman (Ferdinando Baldi, 1971), and That'll Be the Day (Claude Whatham, 1973). In 1971, Ringo also starred as Larry the Dwarf in Frank Zappa's 200 Motels and was featured in fellow rock icon Harry Nilsson's animated film The Point! In 1972, he released his most successful UK single, Back Off Boogaloo, which peaked at number two. Having become friends with the English singer Marc Bolan, Starr made his directorial debut with the T. Rex documentary Born to Boogie (1972). In 1973, Ringo produced the bizarre horror movie spoof Son of Dracula (Freddie Francis, 1974), in which he co-starred with Harry Nilsson. Starr also released the successful singles Photograph (1973) and You're Sixteen (1974). Both were songs from his critically acclaimed album Ringo (1973), which was a top ten release in both the UK and the US. His next album Goodnight Vienna (1974) was also successful, and featured musical contributions from Lennon, Elton John and Harry Nilsson. In the following years, his musical career diminished, although he continued to record and remained a familiar celebrity presence. He played the pope in Ken Russell's film Lisztomania (1975), and one of Mae West’s husbands in Sextette (Ken Hughes, 1978). He also appeared as a guest at the Band's farewell concert in 1976, featured in Martin Scorsese’s documentary The Last Waltz (1978). During the 1980s, Ringo starred in films like Caveman (Carl Gottlieb, 1981) with future wife Barbara Bach and he played a fictionalised version of himself in Paul McCartney's Give My Regards to Broad Street (Peter Webb, 1984). After having a long period of troubles with alcohol, Ringo and Barbara Bach attended a rehabilitation clinic, and came back to the scene sober. Starr maintained a high public profile through his narration of the popular children's series Thomas the Tank Engine & Friends (1984-1986), based on the books by the Reverend W. Awdry. In 1989, Starr was nominated for a Daytime Emmy Award for his role as Mr. Conductor in the television series Shining Time Station (1989), a spin-off of Thomas the Tank Engine & Friends. Starr made a cameo appearance on The Simpsons episode Brush with Greatness (1991) and contributed an original song, You Never Know, to the soundtrack of the film Curly Sue (John Hughes, 1991). Since 1989, he has toured with twelve variations of Ringo Starr & His All-Starr Band. In 1994, Starr began a collaboration with the surviving former Beatles for the Beatles Anthology project. They recorded two new Beatles songs built around solo vocal and piano tapes recorded by Lennon and gave lengthy interviews about the Beatles' career. Ringo Starr and his first wife Maureen Cox had three children: Zak (1965), Jason (1967) and Lee (1970). Following Starr's repeated infidelities, the couple divorced in 1975. In 1980, while on the set of the film Caveman, Starr met actress Barbara Bach. They were married in 1981. Ringo Starr has seven grandchildren – one from Zak, three from Jason and three from Lee. Starr and Bach split their time between homes in England, Switzerland and Los Angeles. 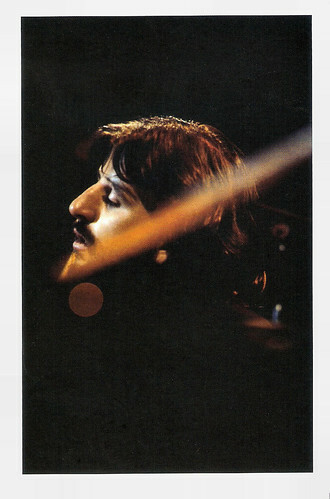 British postcard by The George Harrison Fund for Unicef / Apple. Photo: Barry Feinstein / Tom Wilkes / Alan Pariser / Apple Films. Publicity still for The Concert for Bangladesh (Saul Swimmer, 1972). Trailer The Magic Christian (1969). Source: Sixstring1965 (YouTube). Trailer Blindman (1971). Source: The Spaghetti Western Database (YouTube). Trailer 200 Motels (1971). Source: Sixstring1965 (YouTube). Trailer Caveman (1981). Source: Peg Mularz (YouTube). Sources: Hal Erickson (AllMovie), Steve Shelokhonov (IMDb), Wikipedia and IMDb.